It may feel like a one-two punch from Mother Nature: first she delivers a relentless spate of 100-degree days. Then she withholds the very commodity that would provide some relief to your lawn: rain. Inspect your sprinklers. Whether you have an underground sprinkler system or hose connected to a mobile sprinkler, ensure your watering tools are in good working order – with no leaks or faulty connections – so you don't waste water. Put a timer on your sprinkler to impose some discipline on your watering regimen. Compile a watering guide for all the greenery in your yard. (A fun way to do it? Take a picture or make a map and superimpose the instructions.) Consult the National Gardening Association's plant database, which offers advice on sun exposure, too. Plant new greenery near trees, shrubs, perennials or ground cover that have similar watering needs. Plants that can be grouped together can be watered together, too. Mulch new and existing greenery. Mulch acts as a soil insulator, keeping it cool and preserving moisture when the temperature above ground is hot and dry. Mulch also carries the benefit of blocking weeds. Water early in the day, when it's cooler and before the full force of the sun causes water to evaporate. Most lawns need about 1 inch of water a week, including rainfall. Label a heavy, glass jar and place it on a steady surface in your yard so you can keep track of when Mother Nature decides to grace Las Vegas with rainfall. 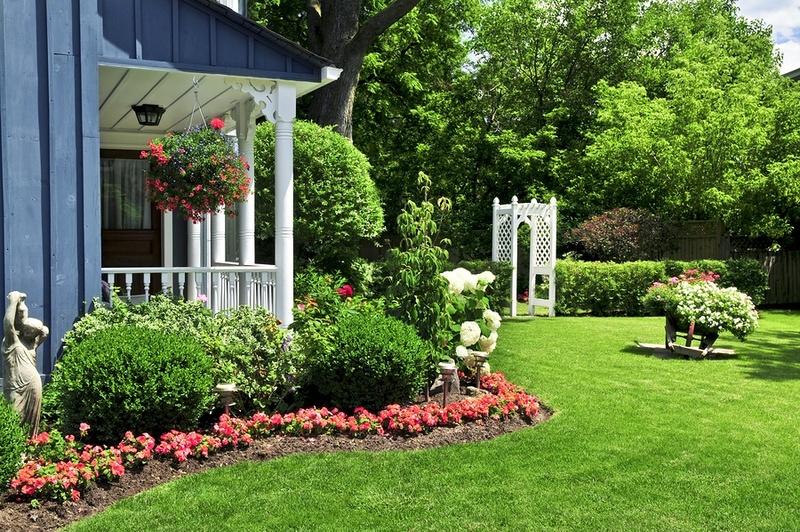 Place greenery in containers closer to your home so they can be shielded from the sun for at least part of the day. A closer proximity will help make walking around with a watering can less of a chore, especially because container plants lose moisture much faster than those in the ground. Purchase a rain barrel. You know how unpredictable Mother Nature can be, so make sure you're ready when she unleashes a torrent of water you don't have to pay for. Place even a small barrel on the side of your house to capture water you can use to water plants, or divert a downspout into a covered barrel. Your healthy lawn may entice you outdoors on cool nights, so be prepared for your vantage point to change and your focus to shift to the exterior shades on your home. Dealing with the sun – and Mother Nature – is one of the challenges Polar Shades' window consultants enjoy most. Call us at 702-260-6110 for a free in-home exterior window shade consultation and together, we'll show her who has the upper hand.